We’ve tackled a lot of information about conditions related to Achilles Tendonitis in the past few articles. From how to do an Achilles Tendon Rupture Test to how to strengthen your tendon with a heel cord stretch- we’ve talked about just about anything. 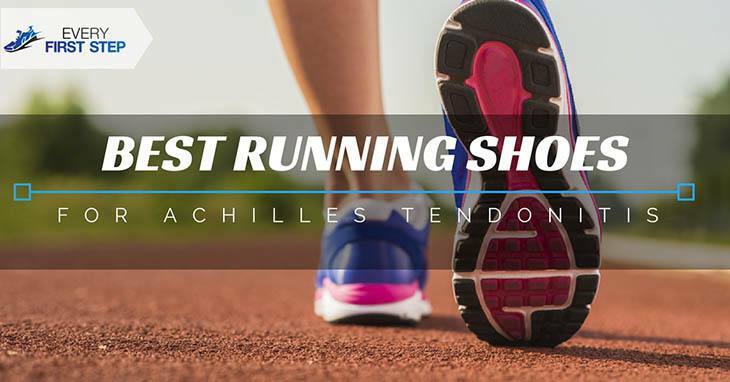 Now we have one more thing to discuss- how to select the best running shoes for Achilles Tendonitis. As I mentioned in previous articles, there are many things you can do to try and cope with your condition such as getting an Achilles tendon massage but if you are to continue running, you need to find the best shoes. I did some shopping around and came up with 5 top picks. The first thing I noticed about the Ultraboost is the cushioning. If you are suffering from conditions including Insertional Achilles Tendonitis, the extra cushion is the best way to go. The shoe has a full-length boost midsole which gives incredible cushioning. Another great thing about the shoe is that it has a Primeknit upper that provides a customized fit for runners with narrow feet. The shoe has a rubber outsole which helps with wet and dry road conditions. The Adidas Ultraboost also comes in a Female version. On the other hand, the shoe may not be suitable if you are running a fast-paced run. In addition, if you have wide feet, you may find the shoe too constricting. If you find that the Adidas Ultraboost is too costly, you may want to consider the Saucony Triumph ISO 3. One thing I really like about the shoe is what they call the 8MM offset which means the cushioning in the heel and forefoot is more evenly distributed. This ensures that your body remains balanced and comfortable. The Triumph ISO 3 is lightweight making it ideal for long runs. The shoe also has Tri-Flex technology for increased force dispersion and maximum traction. Many users complain that the shoe is too stiff initially and may require breaking in. The fabric in the toe box may also be loose due to a manufacturing problem. Both the first and second options are still quite costly so if you are looking for something on a budget, the Brooks Ravenna 9 may be the answer. Aside from being budget-friendly, the shoes I find to be ideal for those who switch pace and distance because of its lightweight nature. The shoes can also work if you have a flat or medium arch and want support. Another thing I loved about the Ravenna 9 is the responsive cushioning which creates a springy underfoot. If you have sweaty feet, you may not find the Ravenna to be breathable enough. The ball of the shoe may also be too hard to bend for some. If you are like my hubby who believes that no cost is too great when it comes to quality, then the ASICS Gel Nimbus 18 might interest you. The style of the shoe presents visual flair with different color schemes impressed me a lot. When it comes to cushioning, the Nimbus 18 does not disappoint. With its full-length cushioning platform, the shoe is very responsive. Another feature is its mid-foot support system which is ideal if you need enhanced gait efficiency. The shoes’ upper is also breathable ideal for hot weather. If you have wide feet, you may find the toe box too narrow. Also, the mid-sole was stiff for some users. If you are a serious runner who does a couple of miles a day, you ought to consider getting the Mizuno Wave Rider 21. The reason why it is a great shoe for daily use has to do with its durability. The outsole is made of rubber and the upper is multi-layered. In addition, the Wave plate is resistant to deformation. The foam insole and blown rubber outsole also provide ample padding for your forefoot. The shoe is also flexible which allows for good turnover and has a breathable upper for hot runs. If you run a marathon, you may find that the shoe is too firm. Considering the amount of rubber used in the shoe, it may be too noisy for some runners. All the shoes above are some of the options you have when choosing the best shoes for Achilles tendonitis. One of the first things you should consider is the support. An ideal shoe has enough support so that the pressure on your calves and heels is reduced. Here are some other things to look for before you make your choice. When we say “extra cushion” we don’t mean you should go for the shoe that makes you feel like you are walking on clouds. In fact, cushioning that is too soft makes the heel sink into the shoes which stretches the Achilles tendon. Too little cushioning does the same. Running shoes for Achilles Tendonitis should be just right-neither too soft nor too hard. Simply put, the Heel drop is the difference between the heel height and the forefoot height. A zero drop shoe the heel and the ball of the forefoot are the same height off the ground. A high or increased heel drop means that the heel is higher off the ground than the forefoot. Generally speaking, if you suffer from Achilles Tendonitis, a drop of 12MM is recommended. If the heel height is too low, it overstrains the Achilles tendon. Another important feature shoes for Achilles Tendonitis should possess is the ability to bend at the balls of the feet. Naturally, your foot bends at the balls of your feet. This ensures that you have adequate support for the foot. Many shoes especially sandals and flip flops bend at all locations. On the other hand, some running shoes are too stiff. Make sure the Achilles tendinitis shoes you choose bend only at the balls of your feet and nowhere else so they don’t put extra strain on the Achilles tendon. The greater the heel height, the less the stretching of the Achilles tendon after each stride. High heels also decrease the range of motion of the calf muscles which can in time cause weakening of the calf muscle. The best women’s shoes for Achilles Tendonitis should not have high heels. In fact, women are advised to generally limit their use of high heels as it can lead to injury. If you think that you’ll go for the super flat shoes, you are wrong again. Heels that are too low overly strain and stretch the Achilles tendon. One way to determine whether your shoe has a low heel is this if the heel is lower than the forefoot. Heel heights lower than ½ to 5/8 inches are too little. The best sneakers for Achilles tendonitis are often slightly elevated which is good. #5: How About Temporary Heel Lifts Or Pads? Since we mentioned that high heels are bad, does this mean that using temporary heel lifts of pads are also bad? No. heel lifts or pads are useful in reducing the strain on the Achilles tendon while allowing you to remain mobile. The temporary heel pads should be used in both shoes to help with balance. It is accepted that no more than 12mm (1/2 inch) of heel elevation should be used. Aside from choosing the best shoes for tendonitis for treating Achilles tendonitis, firm lifts or pads should be used instead of the soft foam materials. The soft materials can cause heel motion and rub in shoes. Since pronation is another problem that can contribute to your tendonitis problem, it is important that you consider this factor before making a choice. Basically, pronation means the area of the foot that makes contact with the ground when you run. Normally, the outside of the heel makes initial contact. Before you decide on what are the best sneakers for Achilles tendonitis, consult a professional and get the proper diagnosis. People who overpronate roll their feel inwards more than normal and push off the ground with the big and second toe. This kind of pronation can trigger additional Achilles tendinitis problems. In fact, Achilles tendinitis can cause overpronation. If you suspect that your tendon is affected by wearing tight shoes, then opting for a motion control shoe is the best option. In addition to the mentioned points, seek professional advice to determine your exact shoe size and pronation. The more you rely on what ‘feels’ right, the more likely you are to make a mistake. Remember, not all shoes that feel like you are walking on the clouds are good for you. In fact, when it comes to shoes for Achilles Tendinitis, neither firm nor soft is the safest way to go. Although it is often difficult for a single cause to be identified, there are aspects of training where runners fall short-training calf muscles and balancing their workload. Runners mostly focus on improving their endurance, running time, speed and such which seem to be directly related to achieving their goal. The problem is some important parts of the body are left out such as the calves. Strong calves are vital in order to support your tendon. Exercises such as heel raise over a step or on a flat surface are easy to include in your routine. Bent-knee heel raises are another excellent exercise to target calf muscles. The point does not forget to work on your calf muscles! Balancing workload can be challenging but it is very worthwhile. Many runners spend a lot of time on the road and also in the gym. Combining a heavy running load with intense strength training could easily lead to overload. An easy way to determine whether you have heavy load is by averaging your load for the past month and comparing it to your current load. If the average of your four weeks is 12 miles and you are doing 18 miles this week, this is too much. An increase of 1-2 miles is okay. Although some runners feel it is necessary for them to work out every single day. Following this trend may put additional pressure on your tendons and lead to inflammation if you are not used to it. So unless you have built up to the level of working out daily gradually, make sure you have at least two days’ rest. During such days, you can still do a few stretches to keep your muscles active. The key to preventing any Achilles tendon injury is to be moderate in your training. As long as you don’t put too much pressure on your tendon, strengthen your calf muscles and have ample rest, you will greatly lower your risk. Clearly, there are myriads of choices you have when it comes to selecting shoes for Achilles Tendonitis. For a shoe that has an incredible cushioning, the Adidas Ultraboost is a good option. If you find the shoe too pricey, then the Saucony Triumph ISO 3 is a good alternative. The shoe provides even cushioning in the heel and forefoot. The ASICS Gel Nimbus 18 is extremely durable and a good choice if the quality is important to you. Lastly, for a running shoe that you can use every day, the Mizuno Wave Rider 21 is durable, flexible and breathable. Which shoes have you found to help with your Achilles Tendonitis problems? Were they included in the top 5 picks? Let us know your thoughts in the comment below.